So excited! 🙂 Along with the fabulous MeLaina Elise Ramos​, I’m thrilled to be offering a brand new writing workshop! At the beach! Whether you’re drawn to the women left out of history books or that aunt in the family no one speaks of, or even your own woman-self, subverted, forgotten, or neglected in the demands of work, parenting, or relationships, the feminine voice is one of complexity, knowing, and power that spans all of human history. And we want to hear it ring! Join us for a gathering in which the mystery, the humor, the wisdom, and especially the strength of the feminine voice is celebrated and empowered. Led by two women writers at different stages in their own work and lives, but who share a deep respect and interest in reclaiming the voices of forgotten or silenced women, this workshop will include readings on and by women who’ve been left out, as well as tons of prompts and exercises specifically designed to help you tap into and strengthen the feminine voice in your writing. $75 includes one-day workshop, tons of prompts and exercises, a take-away packet of reading and resource materials, and gifts created just for you. If interested, email at vaprlover@gmail.com & carrollhackettma@gmail.com for details. Yesterday we had the first house concert reading in Williamsburg, Virginia. It was a blast! 🙂 My wonderful hosts, MeLaina and Frank (and Maddie and LeiLani and Lorenzo 🙂 ) had prepped everything, and I’m so grateful to them for opening their home and their hearts to me and this new adventure. I was sooo nervous. Excited. But nervous. In a way that’s different than before other experiences. I’ve given readings. Not tons and tons, but a respectable number, and I’m always a little pace-y, a little twitchy. But this was different. More. Maybe because it was so unknown. Maybe it’s because I’ve been blabbing and blogging this idea, this new-again salon, this house concert reading model, and so if it fell apart around me, it was gonna be in a big ol’ public way. 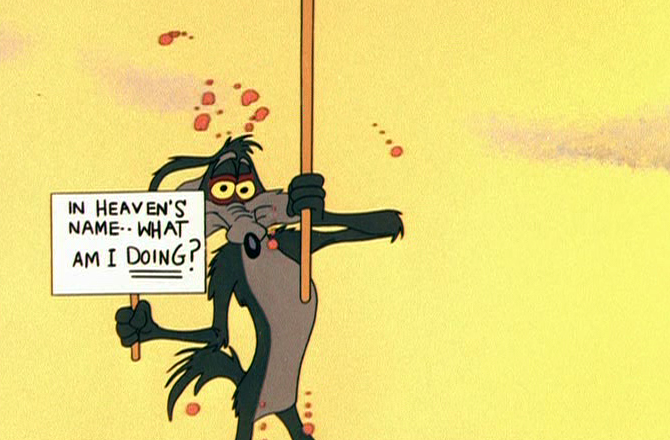 🙂 But yeah, I’ve had that happen before, time and again over my life—set off on some crazy idea I have only to have the timing or the powers that be or the universe slam a big old brick wall down in front of me to run face-first into in the same grand tradition from my childhood of that coyote chasing that roadrunner. But I really think a large part of the nervousness was how badly I want this to work, not just for me, but for poetry and poets in general. I don’t want to feel at the mercy of someone or something else when it comes to controlling my creative life or defining my success. And in ways that matter to me more than I can express, I don’t want my students to feel that kind of helplessness. I want them to stay excited about the work and the business of being an artist. I want them feel empowered and hopeful about sharing their work with the world. 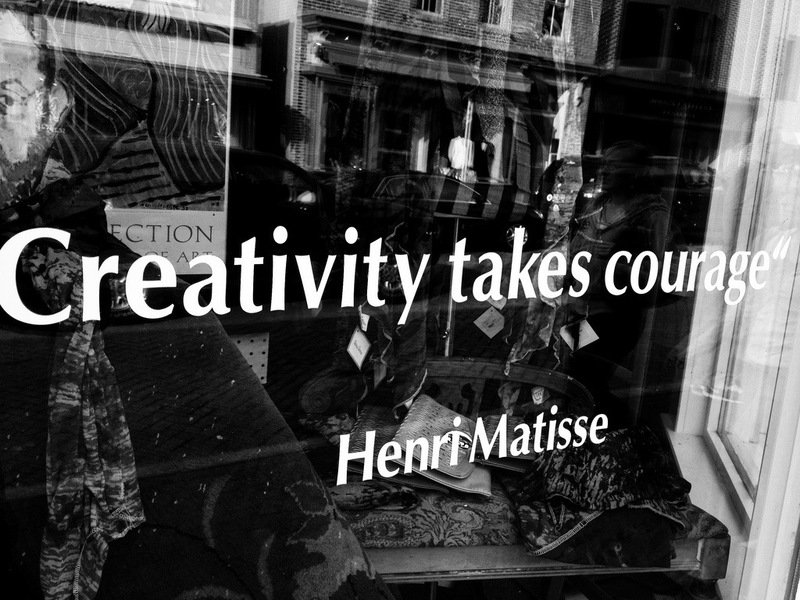 I’ve heard all kinds of reasons artists give for making their art, for living the writer’s life. And I’m not trying in any way to diminish what any writer says he or she wants from the creative life they’re living or making. But I would challenge any writer to deny that at the heart of what we do burns the desire to be read. And if we want to be read, we have to make art, but we also have to sell art. We have to be business savvy. We have to learn to be as creative and fearless in the getting-art-out-there part as we are in getting the words on the page. I tell my students a story I heard years ago, not even sure where I heard it now, about a study done by a psychology department on luck. I would cite the source if I could remember it, but it went something like this: A large group of test subjects were asked if they believed in luck, if they thought they were lucky or not. The group was split between those who did believe in luck, and a smaller break out between whose who didn’t believe they personally were lucky, and those who didn’t believe in luck at all. Belief parameters established, they walked the test subjects through an area in which they had planted ten, twenty, and fifty dollar bills. At a rate of more than eight to one (those are the numbers I remember from my first hearing anyway…. ), the people who believed they were lucky spotted the planted money. Where this study actually took place, or when, or whether the numbers are right or not (I can’t even recall the teacher who told it to me), the point, I believe, is how much our perception feeds and manifests our passions into reality. What we call luck, I believe, is something we have way more control over than we generally believe, particularly if we’re willing to take risks and get creative, in both how we define our success and how we pursue it—and more importantly, I think, in how we perceive ourselves. Yes, I’m an artist. But I also have to be a business person, in the business of promoting my art, both my own individually, and that of others in my field. In my case, that means writers. For me personally, it especially means promoting poetry. Or what many call the Po-Biz. What is the Po-Biz? It is networking, submitting, editing; revising, getting rejected, submitting again, doing anything you need to do to get your poems out into the hands of the readers. You know, in journals, online, at conferences. Out there. In the world. In the poetry world. Which we’ve been told repeatedly is dead. So maybe it’s time to rethink what this Po-Biz is. And if we’re gauging on book sales, poetry is arguably in crisis. Maybe it’s time to pay a little more attention to Biz part of all this. Poetry publishers do the best they can on their end, most of them taking on the whole task as a labor of love, putting their own resources and energy into the creation of the very books we as writers covet having with our names on the front. So how are we, as individual artists, doing our part? Commerce—that’s the part we don’t want to think, or talk about. But we have to, don’t we? We live in a culture of commodification, and as much as we sooooo don’t want to think of or talk about our beloved poetry as a commodity, we do, in the face of this crisis, have to think and talk about value. Not just the intrinsic value we know poetry to have, both for the individual and the culture as a whole, the beauty and solace it can bring to our lives, but value in the commerce-based culture in which we’re creating it. 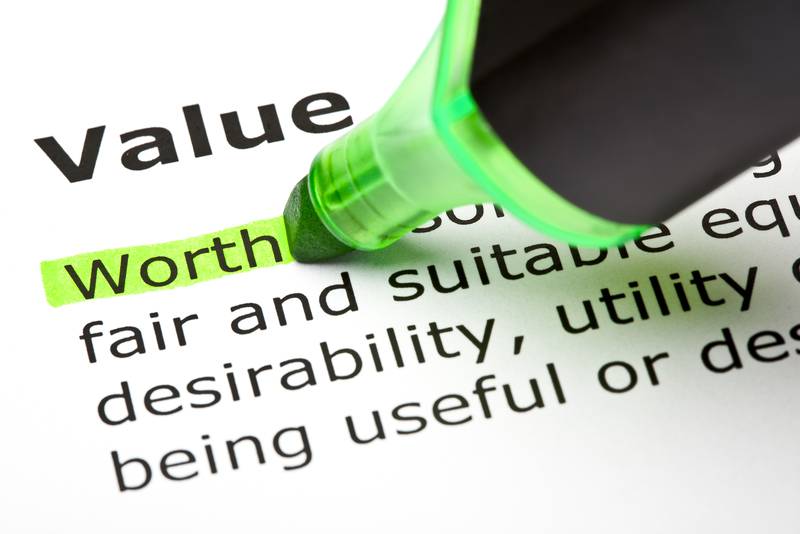 How are we, as the makers, defining that value? Or are we letting others define it for us, while we stand by and mourn their (whoever they are—publishers, critics…) decisions? And how do we bring what we do back into a place where it’s valued in our culture? No one’s writing a never-ending eulogy for indie music; so why poetry? I think it has to do, at least partly, with the message we ourselves are sending. Musicians don’t play only for other musicians. 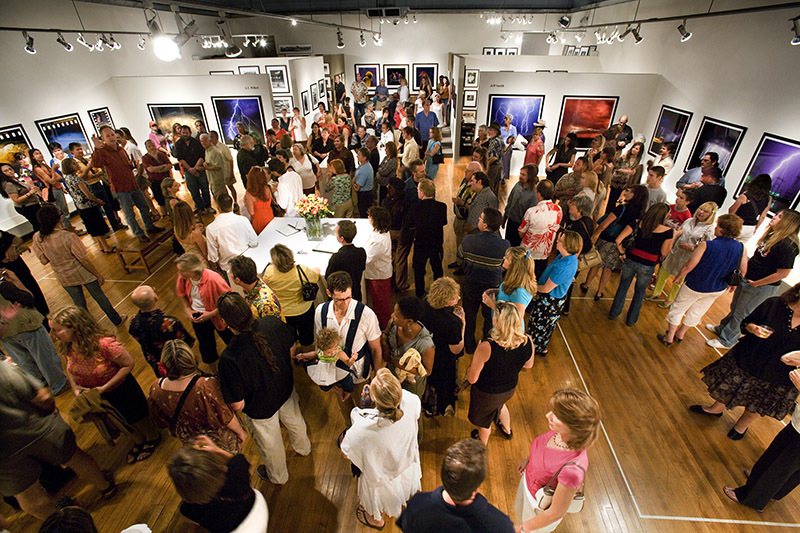 Nor do painters or photographers or illustrators only promote their work to other visual artists. They send a clear message that the work they do has value. 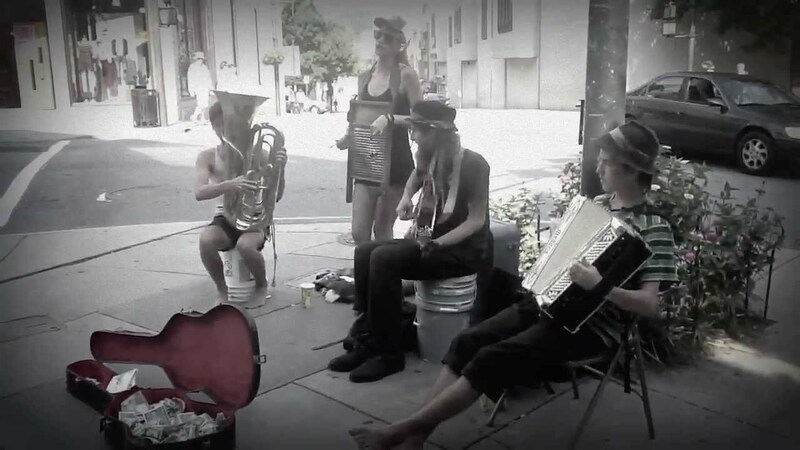 Even buskers throw open the guitar case for monetary donations, sending that same message: If you like what I do, here’s how you express your appreciation for its value. Yes, not everything can be commodified. And yes, we don’t go into poetry for the money. But we do, as writers, complain a lot about the fact that it isn’t valued in the larger market, without, I believe, thinking through and getting really honest about what that word value really means in all its permutations. Yesterday’s first poetry house concert embodied all my own personal beliefs of the value of poetry as a whole. Shared emotional communication of the kind only poetry can do. Community. Celebration. Conversation. And real-by-gawd-book-buying Readers. In a perfect Mother’s Day weekend atmosphere of celebration, complete with my host’s beautiful babies scampering through the flowers and snitching peanut butter cookies from the refreshment table, around twenty people came together among the brilliant blaze of azalea and rhododendron to get this crazy tour started. Some of the guests I knew, former students. Several brought their own moms, an added delight to an already beautiful day. Others were friends of my host, and neighbors, and coworkers, new friends to me now, and new or back-again readers of contemporary poetry. Each attendee made a donation as they entered MeLaina’s gorgeous Birdhouse back yard, willing and happy they told me over the day, to support a local artist, to have the experience of sharing that time and space together. We shared food, time, such good talk, and poetry, not just the work I read, but in the one on one conversations after, as I inscribed twenty copies of The Night I Heard Everything, I heard stories of the poetry and poets they remembered from childhood, the memories of middle school teachers who read poetry to their classes. 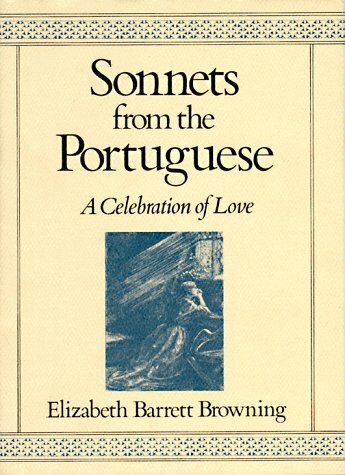 One beautiful elder told me in the softest voice about the reading of Sonnets From the Portuguese 43 at her wedding sixty years ago. Leah, a bubbly middle school teacher, told me how she had gone to readings while she was in college, and how much she missed gatherings like the laughter-filled crowd we stood in at that moment. She made me promise that if I had another book come out, I’d come back and do it all again. Ain’t gonna lie 🙂 If you know what a moosh I am, I couldn’t anyway. I got a little weepy signing some of those books, so grateful for their generosity, so grateful for the moment, so grateful for poetry being in my life. Fifteen copies of the book accompanied the day’s donations. Another five or so people who came had already bought copies of the book online and brought those copies with them for me to sign. And given the questions I was asked about what other poets I love and would suggest, perhaps one of the benefits of this was also a new group of people who before might not have checked out the poetry shelves at a bookstore, but who now just might. The readers are out there. But we have to change how we find them and put poetry directly into their hands. So…how’d the first poetry house concert work out? Can’t wait for the next one! May 23rd, Raleigh, NC 🙂 Have poetry! Will travel! 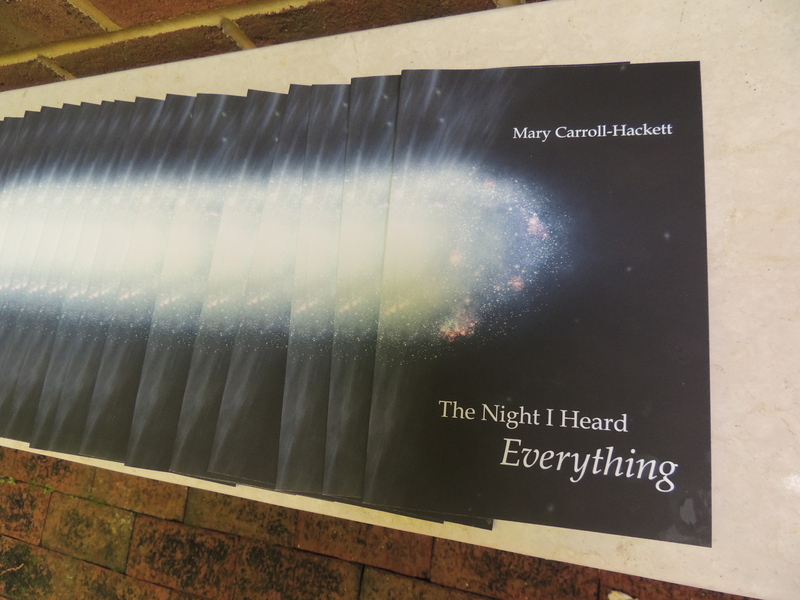 I’ve been working this week on getting promotional materials together for this THE HEARD EVERYTHING INTERSTELLAR BOOK TOUR! Thanks to my computer-whiz son, a talented artist and photographer and all-around-awesome-grown-kid, J Hackett, this happened! So it’s feeling real now, y’all–this poetry house concert tour. And I’m getting into the logistics of all this fun. So what’s a house concert anyway? And where did all this start? A traditional house concert is a musical concert or performance art presented in someone’s home or apartment or a nearby small private space such as a rec room, barn, lawn, or back yard. 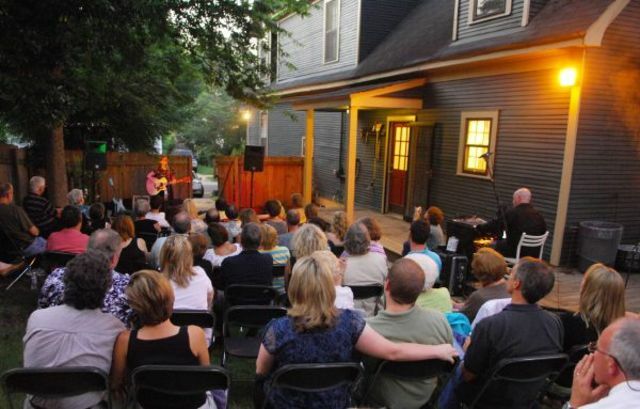 The feel-good adjective most often heard to describe a house concert experience is intimate. While this is all exciting and new to me as a poet, house performances actually have been around a long time, across all of the arts. People have pulled a chair or some grass or shook out a blanket for centuries, to be entertained by the traveling bard in ancient Ireland, or to listen to the 16th century music performed in a chamber in a nobleman’s home (thus chamber music), on into the 19th and 20th century when the Vanderbilts and the Carnegies had their fancy friends in to hear noted artists on those thunderously grand old pipe organs. 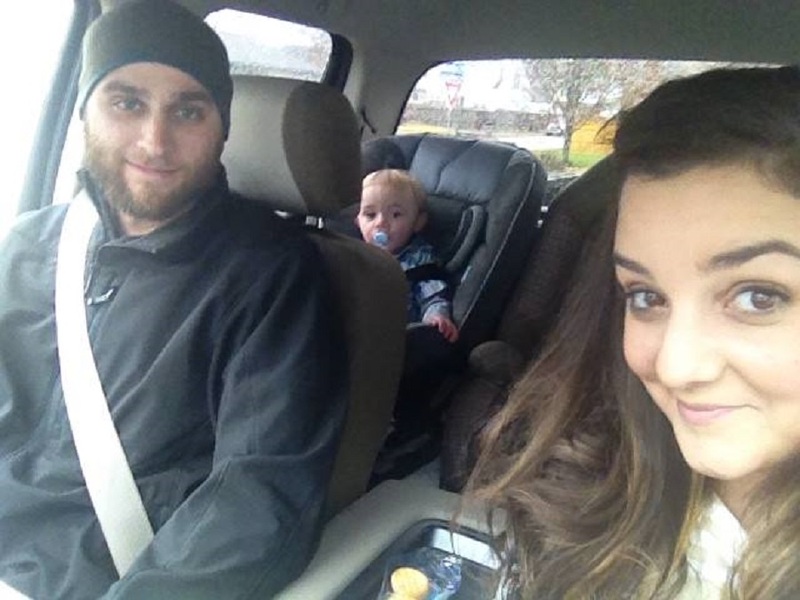 These get-togethers weren’t confined to the wealthy. While the examples associated with the upper classes are the ones recorded in the history books, I’m sure enough to argue that the earliest performances of this kind took place much much earlier, folks gathered around fires, on porches, on break from working in the fields, where music and poetry and storytelling all gave not only comfort and entertainment, but became the beautiful and artful records of the rich lives of people who seldom make it into those same history texts. 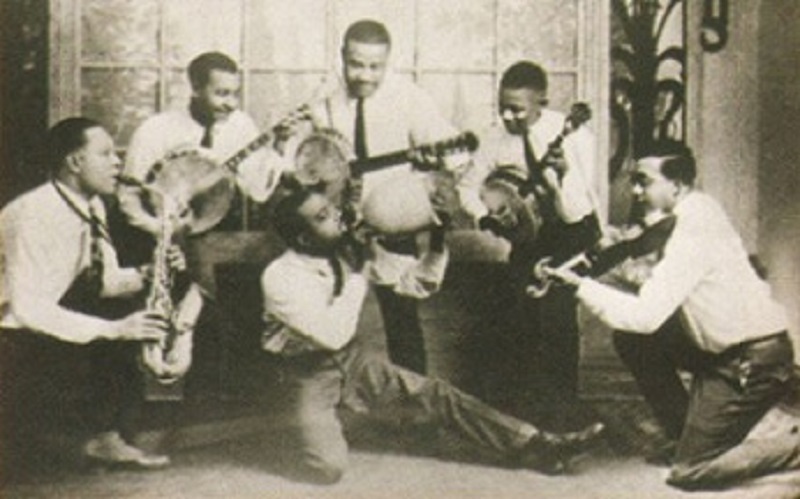 Folk music, country music, and blues music in the United States all have long histories of this kind of performance, prior to the rise of availability of recorded music. History is filled with examples of people gathering in private homes and backyards to enjoy music and recitations, to support artists of all kinds. House concerts have made a major resurgence in the 20th and 21st centuries, with all genres getting in on the fun. According to Wikipedia, DJ Kool Herc is credited with helping to start hip hop and rap music at a house concert at an apartment building in the South Bronx. North American punk music came to life in basements, and I’m old enough to remember and too old to tell you how many garage bands I personally sat on concrete to listen to in my own rock’n’roll coming of age in the 70s and 80s. I’ve heard some of the best music ever sitting in a lawn chair, eating potluck mac’n’cheese, and drinking from a plastic cup, having made my donation, happily grateful for the music and the company. House Concert with the fabulous Daniel Bailey Summer 2012 🙂 See the link to Daniel’s website below! But historically, this wasn’t limited to music. Time travel again back to 16th century Italy where the tradition of the salone or salon began and flourished well into the 17th and 18th centuries throughout Europe. Again, according to Wikipedia, a salon is a gathering of people under the roof of an inspiring host, held partly to amuse one another and partly to increase the knowledge of the participants through conversation about literature, philosophy, politics, and the arts. Horace said the aim of Poetry was “either to please or to educate” (“aut delectare aut prodesse est”). From Princess Anna Amalia of Prussia who transformed her court into the most influential cultural center of Germany in the 1700s, getting the conversation on for the likes of Goethe and Christoph Martin Wieland, poet and translator of William Shakespeare to the famed French patronesses of all the arts, literary salons go way back. 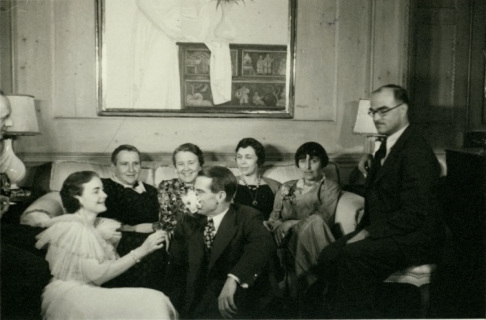 Jump forward through time and the literary salon rocked on, with Mark Twain and the Bohemians of San Francisco, to Gertrude Stein’s famous Saturday gatherings in Paris, to the legendary parties of Gerald and Sara Murphy—Wait, who? Gerald and Sara Murphy aren’t as well-remembered as their famous group of friends, but without the Murphys’ support, financial and emotional, in 1920s Paris, the greats like Ernest Hemingway, the Fitzgeralds, Pablo Picasso, Cole Porter, and other shining stars of the Lost Generation may not have even made the art we’re lucky enough to still have today. Because—and yes, I know I said this last time 🙂 — the real stars of the house concert model are the hosts, people willing to open that garden gate, invite friends, and show generous public support for the arts. I asked my friends if they’d be willing to host a poetry house concert to promote my new book, and they said Yes, ’cause they’re beautiful and generous like that. They were as as excited about the idea as I was! And the cool thing that’s happened since I first asked is that the events are taking on the personalities of the beautiful people hosting them, as diverse and interesting as they are themselves. That’s been some of the most fun for me! We coordinated calendars, chose dates. I suggested the potluck, hoping to create the least work, cost, or inconvenience for these kind people as I could. Then I drafted the basic invitation, sending it to my hosts to change as needed to fit their event. 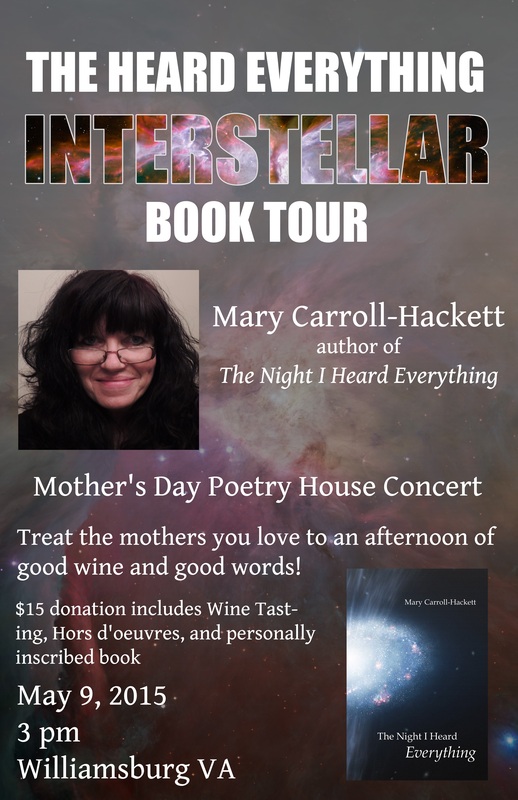 The Heard Everything Interstellar Book Release Tour! You’re invited to a brand new kind of house concert—A Poetry Party! Join us for good food, good drink, good company, and a poetry reading! with an optional potluck dinner starting at 6 pm. If you are coming to the dinner, please bring a dish, dessert or drink to share. What else: The suggested donation (we’re all pitching in to pay the artist!) is $15. Each guest receives a personally inscribed copy of the poet’s book. 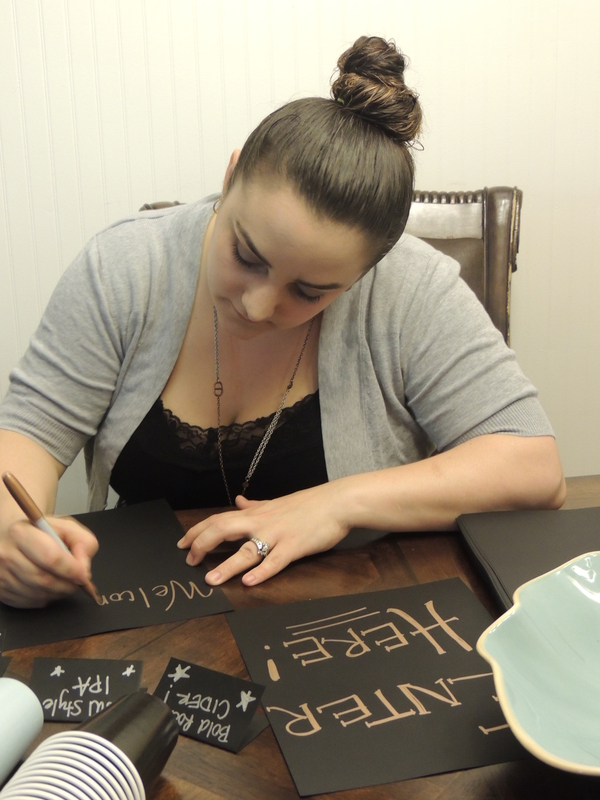 How many people you invite will be determined by the space, so build an invitation list with your hosts. And don’t limit your invitations to literary types. I’m not a musician, but I love and support musicians. And I love the idea of sharing poetry with people who might not seek it out, and learning from those same people. I mean…that’s where poems come from, right–all kinds of people living all kinds of lives out in the world? 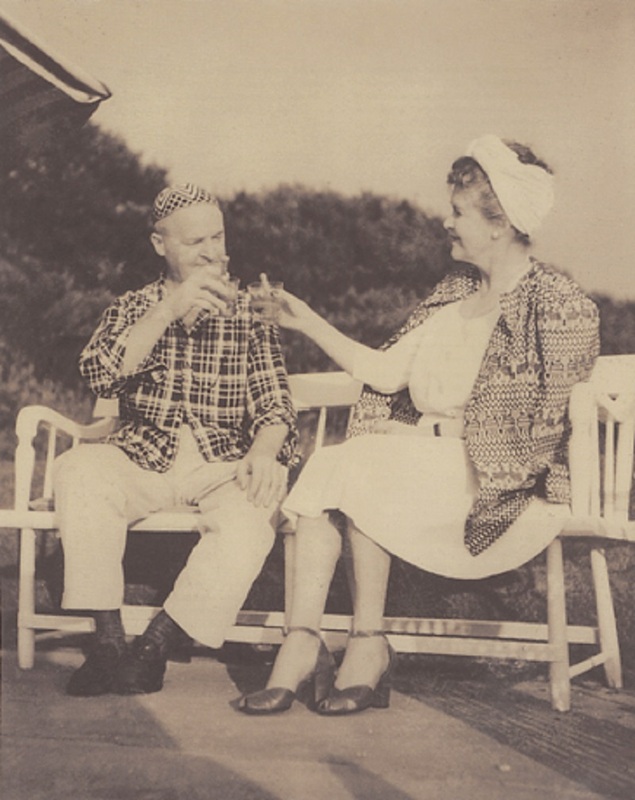 Uncle Walt and Auntie Gertrude threw those doors open for all types, and our recent tendency to forget that may very well be one of the biggest obstacles leading to all those Poetry is dead conversations, which, by the way, in my opinion, is hogwash. It ain’t dead a bit. But it could be argued that its disappearance into the academy has been something like a much-too-long-drug-induced coma. Time to wake it up? Whatcha think? Mmmhmmm, poets 🙂 I can hear those gears turning even from here 🙂 Would my friends–? Who could I ask–? I wonder if they might–? Do it! Ask! That box of beautiful books that you worked on so hard and for so long sitting there on your floor isn’t going to magically jump up and take themselves into the world 🙂 But your loving friends just might help you make it happen. ‘Cause yeahhh, one thing I have happily learned over the years–artists hang out with the coolest people 🙂 Like you. Next up: About that Donation—You want me to pay for what????!! !